The tests were carried out as part of Blue Origin's partnership with the National Aeronautics and Space Administration (NASA) under the agency's Commercial Crew Development (CCDev) program. Blue Origin is designing the Space Vehicle to provide safe, affordable transport of up to seven astronauts to low-Earth orbit and the International Space Station. "Our Space Vehicle's innovative biconic shape provides greater cross-range and interior volume than traditional capsules without the weight penalty of winged spacecraft," stated Rob Meyerson, president and program manager of Blue Origin. "This is just one of the vehicle's many features that enhance the safety and affordability of human spaceflight, a goal we share with NASA." The wind tunnel tests validated Blue Origin's analysis of the Space Vehicle's aerodynamics during descent through the atmosphere and the ability to change its flight path, increasing the number of available landing opportunities each day and enhancing the vehicle's emergency return capability. 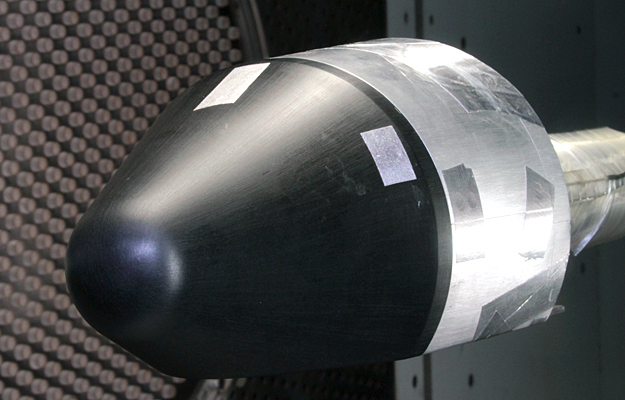 More than 180 tests were conducted over the past several weeks at Lockheed Martin's High Speed Wind Tunnel Facility in Dallas. Under CCDev, Blue Origin is maturing the design of the Space Vehicle, including its aerodynamic characteristics, culminating in a System Requirements Review in May of this year. Blue Origin will conduct tests of its pusher escape system later this year, demonstrating the ability to control the flight path of a subscale crew capsule using an innovative thrust vector control system. Also under CCDev, Blue Origin is conducting tests of the thrust chamber assembly (TCA) for the BE 3 100,000-lbf liquid oxygen, liquid hydrogen rocket engine, which was recently installed on the E 1 complex test stand at NASA's Stennis Space Center. Blue Origin, LLC (Blue Origin) is a private company developing vehicles and technologies to enable commercial human space transportation. Founded in 2000, the company has a long-term vision of greatly increasing the number of people that fly into space through low-cost, highly reliable commercial space transportation. For more information and a list of job openings, visit http://www.blueorigin.com.